National Geographic Traveller (UK) looks to Southeast Asia in the October issue of the magazine. We head to Cambodia, Malaysia, Singapore, Thailand and Vietnam and tuck into some of the region’s most appetising dishes. 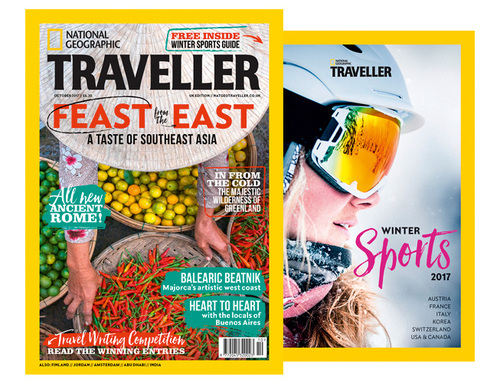 It’s all part of the new 188-page October 2017 issue of National Geographic Traveller (UK), which has hit the newsstands with a FREE Winter Sports guide. Destinations: We head to the mountains of Majorca; journey through the verdant state of Karnataka, India; and spend a long weekend in Finland. Our picture story, meanwhile, captures the snowy landscapes of Greenland. Cities: Our urban highlights this issue include Amsterdam, Abu Dhabi, Buenos Aires and Rome. Smart Traveller: The world’s oldest library in Fez; southern California’s art showcase; the best rooms in Thessaloniki; a tour of Hampstead’s literary trail; Stuart Maconie’s journey through Britain; and a trip to Dundee. Author Series: Mark Rowe on the Outer Hebrides. Travel Geeks: Ask the Experts includes tips on travel to the Tibetan Plateau, the best place for an active winter sun break, plus campervan trips and new package holiday regulations.